Maybe you've never tried Soft Paws® nail caps on your pet, and you're wondering how on Earth you will get them to stay on. Maybe you've used them, and your pet has chewed them off or, worse yet, they fell off. Don't worry; these situations are easy to resolve so you can enjoy the many advantages offered by Soft Paws® nail caps. If the Soft Paws® you use aren't the right size for your pet's claws, they may fall off. You can find helpful tips for choosing the right size for cats here: Size Guidelines for Cats and for dogs here: Size Guidelines for Dogs. Before you open the bottle of adhesive that comes with your Soft Paws® kit, check to see if you've chosen the right size. Place a cap with no glue in it onto one of your pet's claws. It should fit snugly, like a glove, but you shouldn't have to push too hard. The cap should fit all the way to the base of the nail without touching the skin. You can trim the open end of the nail cap to adjust its size for a better fit. Sometimes, especially with dogs, each claw is a little bit different, so each cap can be sized individually. Soft Paws® caps can fall off if a sufficient amount of adhesive isn't used when they are applied. It's also important not to apply too much glue because it could overflow out of the cap and onto your pet's skin and hair. This is uncomfortable for the pet and can trigger him to lick and chew at the Soft Paws®, removing them. It may take a little practice to get efficient at putting just the right amount of adhesive in the caps, but luckily there's an easy way to make sure you get it right every time. 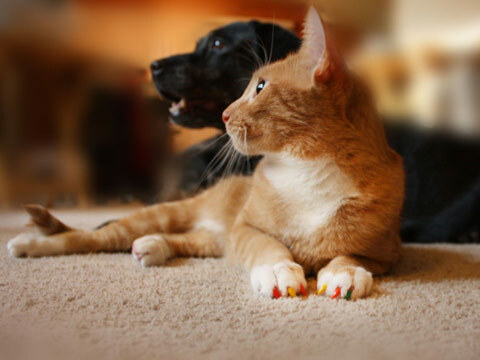 Before you apply each nail cap to your pet's claw, put glue into it and squeeze the sides gently. If it overflows, there is too much. If it doesn't cover the entire inside of the cap evenly, there isn't enough. Once you've got the right amount of adhesive in the nail cap, place it on your pet's claw, and apply pressure evenly all around it. Be careful not to push the cap up into your pet's skin while putting it on because that will cause discomfort and trigger licking and chewing. Sometimes pets will chew on their nail caps until they get them off. This is especially common the first time the caps are applied, but some persistent animals will do it after future applications, as well. Fortunately, there are some easy fixes for this situation. Distract your pet. When you are applying Soft Paws® to your pet, use a calm voice and demeanor. Many people find that it helps to do the application when their pet is sleepy. As soon as you're finished applying the nail caps, distract your pet with a play session, cuddle-fest, favorite treat, or by giving them a meal. Apply a deterrent to the nail caps. Pets can be discouraged from licking and chewing at their Soft Paws® by applying a deterrent like Grannick's Bitter Apple Spray or Yuk to them. In the beginning, you may need to reapply the product every few hours, but as your pet gets used to wearing the nail caps, you may only need to do it once when you first apply them. Make sure you're not touching your pet's skin with the caps or glue. If the Soft Paws® are being pushed into the skin around your pet's nails, he will be irritated by them and will probably chew on them. When you place the nail caps on your pet, don't push them into the skin. This is another great reason to check out how much glue you have in the cap before you place it on your pet's claw: too much glue will squeeze out and onto the pet's skin and fur, which will also cause him irritation. Check the Soft Paws® periodically, and replace any lost ones. When you first start using Soft Paws® on your pet, replacing any lost ones right away will help him get used to wearing them faster and let him know that, even if he chews them off, they won't be gone for long.